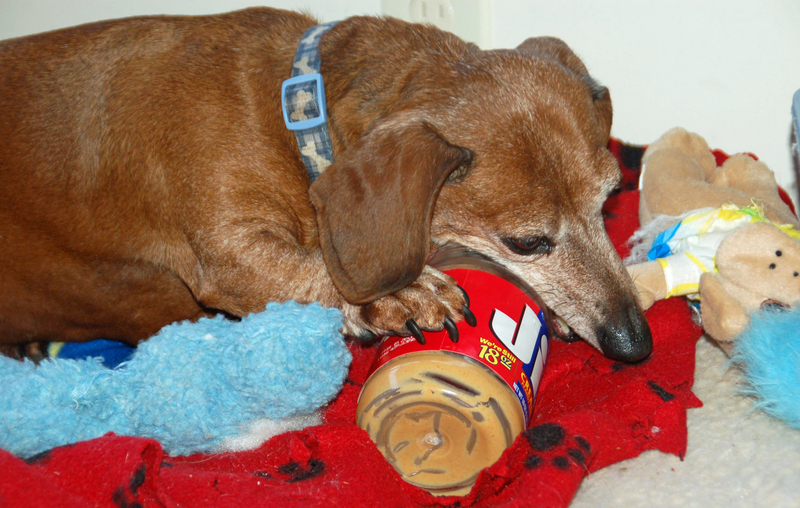 Jake must clean the peanut butter jar before it goes into the recycling bin. Hope is breathing better, but she is getting finicky about how she takes her pills. Yesterday, $6.98 a pound roast turkey from the Kroger deli was good enough for her. Yesterday Windy enjoyed her breakfast so much she brought it back to eat it again. Today she is at our regular vet getting a tooth pulled. It’s always better to head off a situation before it becomes a problem, and problems with teeth can lead to bigger health issues. Jake should have gone to medical school. Each night he gives Hope a good licking all over her back and hips. This relaxes Hope, and Jake seems to enjoy doing it. Perhaps Jake’s retirement career can be doggie massage therapist. This entry was posted in Dachshunds, Dog Behavior, Dog Health and tagged Dachshunds, Dog Behavior, dog health. Bookmark the permalink.